The purpose of this text is to explain some physical background of ball juggling. While the number of hands and the timing of throws is abstracted away in the mathematical theory of juggling, these quantities play a central role in this text. The present version of the text is work in progress and will hopefully be extended. In this section we will have a look at a real-world juggling pattern to see what is going on. We will get timing information from the pattern, derive Shannon's first theorem about juggling, and finish this section by exploring how fast or slow you can juggle while keeping the same height of throws. The basis of our analysis is a sequence of pictures showing the site-swap 4444535344 with a time resolution of 1/30 second. One of the pictures is shown at the right. Table 1 gives a time-line of events in the picture sequence. Table 1. This table summarises the sequence of events in the picture series. It gives the times and order of all throws and catches. Our first aim is to measure the frequency of the throws. The linear least squares fit of the data from the table is t(n) = 0.229*n - 0.187, where t(n) denotes the time of throw number n. This is illustrated in figure 1. You can see that one beat lasts approximately 229ms but the right hand starts to lag behind a little bit in the second half of the sequence. Figure 1. The linear least squares fit for the throwing times is t(n)=0.229*n-0.187. Thus the length of one beat is approximately 0.229 seconds. In between the throws, the hands spend part of the time moving empty to catch the next ball. Another part of the time is spent holding or carrying the balls. This is illustrated in the next figure. Figure 2. Graphical illustration of holding times: the upper band corresponds to the left hand, the lower band to the right hand. Gray strips indicate that the corresponding hand is empty. The unit on the horizontal axis is seconds. At the beginning of the sequence the right hand is holding two balls (green and blue). After this initial phase there are some obvious balance considerations. and thus we get the following result, which was first derived by the famous mathematician Claude Shannon. As an illustration we check that the theorem really holds for our example sequence of throws. Table 2. Measured holding and empty times for the hands in the interval from t=0.100 to t=2.100. Table 3. Measured holding and flight times for the balls in the interval from t=0.100 to t=2.100. Thus the left hand side of the equation in Shannon's theorem becomes (2.602+5.398)/(2.602+1.398) = 8 / 4 = 2 as expected. Shannon's theorem as stated above does not require the juggling pattern to be periodic. But when applied to patterns like 3 or 4 where all throws are the same height, things can be simplified. Definition. A juggling pattern is called uniform if each ball every time it is caught is held for the same amount of time (the holding time ), each ball every time it is thrown flies for the same amount of time (the flight time ), between each pair of adjacent throws the hands are empty for the same amount of time (the empty time ) and each hand holds at each instant of time at most one ball. Figure 3. Timing diagram for a uniform 4-ball juggling sequence using 2 hands. One hand juggles the blue and yellow balls, the other hand the red and green ones. The horizontal axis is time, holding times are marked gray and flight times are marked in the ball's colour. The holding time is h=0.3, the flight time is f=0.6. The light gray boxes in the background mark two different time intervals of length h+f. The diagram illustrates that each time interval of this length contains equal amounts of accumulated holding, flight and empty times. Good jugglers can vary the speed of a pattern to some extent while keeping the height of their throws the same. The extremes are called hot potato juggling (throwing the balls almost immediately after catching them) and lazy juggling (holding the balls as long as possible). Since the height of the throw is determined by its flight time (we will examine this relation below), keeping the height of the throws the same implies that the flight time is not changed. How fast or how slow can we juggle for a given flight time f? Theorem 3 (speed of juggling for fixed flight times). For a uniform juggling sequence with evenly spaced beats and with h hands, b>h balls and flight time f, the length of a beat is between f/b and f/(b-h). Since the holding time is zero, the distance of one hand's throws is f⋅h/b+0 = f⋅h/b. Assuming that the beats for all h hands are evenly spaced we find the length of a beat in hot potato juggling with flight time f to be f/b. and, since the empty time is zero, the length of a beat for lazy juggling with flight time f is f/(b-h). This completes the proof. Example. For the juggling sequence from table 1 the average flight time of a 4 is approximately 0.6 seconds. Since the pattern has 4 balls and two hands, the length of a beat for a uniform pattern would be between 0.6/4=0.15 seconds and 0.6/(4-2)=0.30 seconds. The length of the beats we measured for the (non-uniform) pattern in table 1 was 0.229 seconds (see figure 1) which is almost exactly in the middle of this interval. Figure 4. 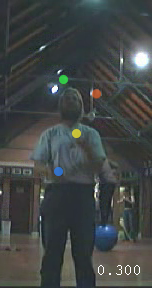 Jochen Voss, juggling three glow-balls. The marked ball is moving from the left to the right along the green parabola. The ball needs 0.567s to cover the designated section of its path, first raising 45.9cm and then falling 33.4cm.